Trying to list the benefits of garlic is a tedious task simply because the health benefits of garlic has been documented for thousands of years and the list never stops growing. Garlic is called nature's antibiotic. It contains allicin, a natural antibiotic, 1 milligram of Allicin has a potency of 15 standard units of Penicillin. It is effective against toxic bacteria, viruses and fungus. Medicinal use of garlic goes back to Greek and Egyptian antiquity. Hippocrates prescribed it for leprosy, toothache, and chest pain. Garlic was used in the nineteenth century for tuberculosis and into World War II for disinfecting battlefield wounds. It is frequently used in an attempt to ward off and treat the common cold. Another health benefit of garlic is that garlic contains more germanium, an anti-cancer agent, than any other herb. In tests with mice and rats, garlic fed groups developed no cancer - where non-garlic fed groups developed some cancers. In Russia, garlic was found to retard tumor growth in humans. Yet another garlic health benefit is that garlic improves, tones, and strengthens entire physical condition. Has rejuvenating effect on all cells. More benefits of garlic is that it builds endurance and energy. Plus it strengthens body defense against allergens. Garlic has soft oils that helps to emulsify plaque and loosen it from arterial walls. It strengthens blood vessels. Equalizes blood pressure, high or low. It may surprise you to know that even more benefits of garlic is that it's used in enemas, besides being used as straight garlic enema, it is excellent to combine with Catnip for a Catnip/Garlic enema. The catnip pull mucus, and soothes the cramping in the colon, the garlic kills the germs and parasites, improves peristaltic action, and also pulls mucus. Studies have shown that the health benefits of garlic can keep the blood vessels to the heart flexible in older people. Research indicates that fresh garlic and garlic extracts can correct certain irregular heart rhythms. Garlic does not destroy the body's normal flora but an important health benefit of garlic is that it stimulates the lymphatic system to throw off waste materials. Ingesting fresh garlic and most extracts results in a characteristic breath odor. This has been linked to the active sulfur-containing compounds. Parsley is recommended as a home remedy for garlic breath. You can read about the benefits of parsley by visiting Grandma's Wisdom. Some of the most intriguing possibilities of using garlic as a medicinal herb is that regular ingestion my help prevent cancer, cardiovascular disorders and blood clots. Other studies have shown that people that ingest garlic more often are less susceptible to stomach or colon cancer. More studies show that another garlic health benefit is it can reduce blood sugar levels and may improve insulin response. Below is an impressive list of diseases and disorders known to have improved over time with ingesting garlic in safe dosages. Please see recommended dosages following the list. This medicinal herb is available in many forms, including fresh bulbs, oil-based extracts, dried powder, and steamed-distilled extracts. To maximize the anti-cancer activity of fresh garlic in cooking, crush or mince it at least ten minutes before heating. For cardiovascular conditions: one clove daily, equivalent to 6 to 10 mg of alliin, or 3 to 5 mg of allicin. Treatment is maintained indefinitely. For common cold treatment/prevention one clove 3 times a day, until symptoms resolve. 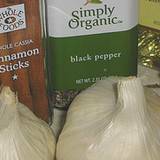 Garlic extract can fight bacteria such as Staphylococcus aureus and Streptococcus pneumoniae. Although it is only 1 percent as active as penicillin, however. 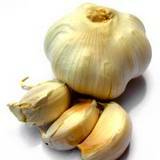 Garlic extract can also fight Helicobacter pylori, a bacterium that causes stomach ulcers. Follow the dosage recommended on the Garlic Extract directions. 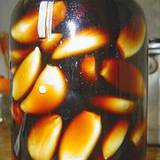 Because garlic can slow blood clotting it's recommended that patients avoid this medicinal herb in the period just prior to and following surgery. People dealing with chronic digestive problems should be cautious, because high doses of garlic can irritate the stomach lining. Moderation is the key to trying any medicinal herb. Pregnant women should exercise moderation. Tests have shown that at high doses garlic extracts can stimulate uterine contractions in animals. People with low thyroid function should be aware that concentrated garlic products my keep the thyroid gland from utilizing iodine properly. This could aggravate an underactive thyroid condition. 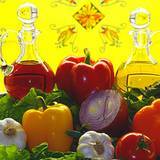 Research has shown that human's taking garlic oil at a dose of 20 cloves of garlic daily for 3 months did not report problems. Most people appear to tolerate garlic well, but some individuals experience digestive distress. People who handle garlic products on a regular basis, like pickers and packers, occasionally develop a skin reaction on exposure (contact dermatitis). 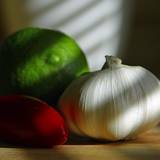 Garlic could increase the risk of bleeding in people taking anticoagulants such as Coumadin, aspirin, Plavix, or Ticlid. There is also a possibility that this herb could interact with drugs such as DiaBeta or Glucotrol that lower blood sugar. Careful monitoring is suggested for anyone combining garlic products with such prescription drugs. Garlic appears to inhibit an enzyme called CYP 2E1. In most cases, this interference is welcome, since this enzyme can make carcinogens more dangerous. But CYP 2E1 is also involved in the metabolism of acetaminophen (Panadol, Tylenoletc.) and a muscle relaxant called chlorzoxazone (Parafon Forte). These drugs could possibly linger longer in people who are taking or eating garlic.